This recipe takes a rather long time to prepare, but believe me, its worth it. 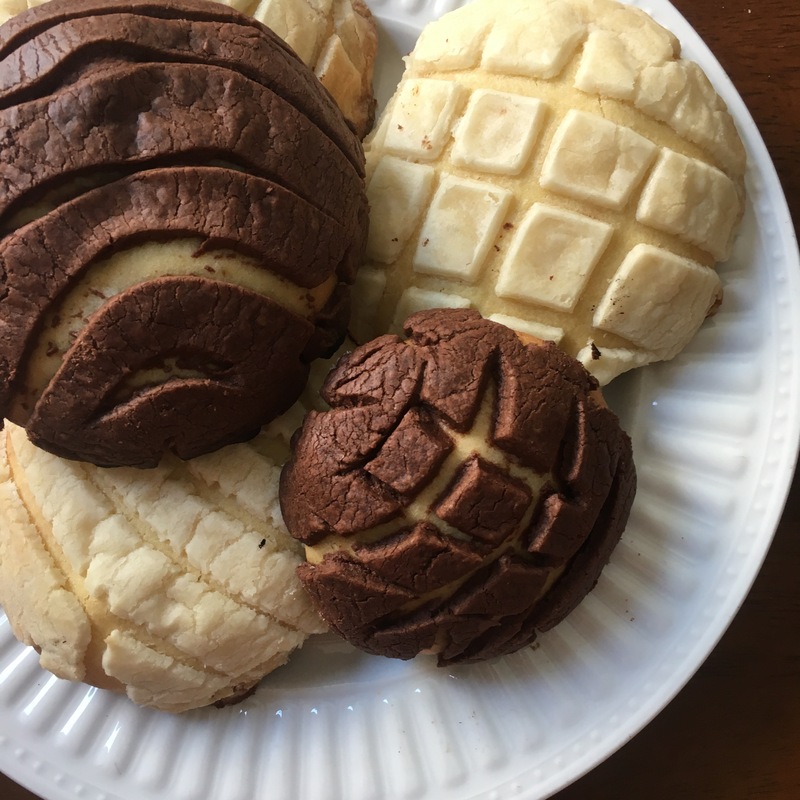 These pastries are a little more dense than what you would purchase in a Mexican market, but the flavor is almost identical I’ll definitely be making these again. In a large bowl, combine the warm water, yeast and 1 TBSP granulated sugar. Let it stand until foamy, about 10 minutes. Add 3 TBSP butter; knead until elastic and very smooth, about 10 minutes. Grease a large bowl with olive oil; place dough in the bowl. Cover with plastic wrap; allow to rise about 1 hour. Transfer dough to a lightly floured surface. Divide into twelve 2 inch pieces. Roll into balls. Place balls on two greased baking sheets. Cover with plastic; let rise until double in size, about 1 hour. Meanwhile for sugar topping, in a large bowl combine 1 C flour, the powdered sugar, and 8 TBSP butter. Mix with hands until a moist dough forms. Divide in half. Add cocoa powder to one half; mix until well incorporated. Divide the plain and chocolate dough into six balls each. Flatten to a 1/4 inch thick disk; place on each concha. Using a sharp knife cut through sugar topping. Flatten each concha slightly; let rise 1 hour. Preheat oven to 375 degrees. Bake 20 minutes or until puffed and edges are golden.